The inaugural game against Derby County on Weds 23rd August 2000 saw an official attendance of 51,327, against a claimed capacity of 52,143 places available. That figure then climbed to over 52,000 by 2003, reaching its highest level to date on 28th August 2006 when 52,327 were present for the Manchester United game - the largest crowd ever to sit at St.James'. Extra seats being added to existing areas was the reason for the small increase to this figure - achieved by the narrowing of aisles etc. It now seems clear that with some Milburn lower seats that aren't sold added to the equation and the sterile area around the away fans, that the actual capacity of the St.James' Park is nearer the 53,000 mark. The last time crowds of this size were accommodated at St.James' was in season 75/76, when on 18th February 1976, 52,760 were on hand for a scoreless draw in the FA Cup against Bolton. For a larger league attendance, one must go back to Boxing Day 1973, when 55,638 saw Paul Madeley score the only goal of the game for Leeds, and send the points back to Yorkshire. However, the all-time ground record of 68,386 set on 3rd September 1930 when Hughie Gallacher returned in the colours of Chelsea seems safe, barring further massive and seemingly unnecessary building work. 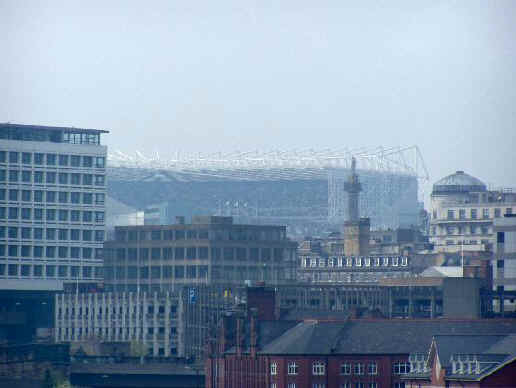 The construction of the upper tiers on the Milburn (West) and Leazes (North) sides of the grounds was completed in July 2000, with seats and executive boxes installed. The East Stand saw the demolition of the old executive boxes and construction of seating blocks from pitch level up to the existing rows, in a mirror image of the Milburn stand. In total 93 executive boxes were constructed. The cost of the new construction work was estimated at £42m - significantly more than the proposed Leazes Park stadium. United also purchased the land around and above the St. James' Metro station, with the eventual aim of building hotel and conference facilities on what is currently the car park. Furniture throughout the ground (executive facilities etc.) was renewed and the unwanted old tables etc. made available to local good causes. In the region of 1,000 seats were also been donated to newly-promoted Scottish League club Elgin City (who also play in black and white.) Local Unibond outfit Blyth Spartans also took around 340 to install at their Croft Park ground. Away supporters are allocated around 3,000 places in the North West Corner (upper tier) corner i.e. Between Milburn & Leazes stands. "Newcastle United will have to return the £5million it received from Las Vegas casino operator MGM Mirage after the Governments proposed cap on super-casinos, between four and ten, makes it highly unlikely that St James’ Park will receive a license. The Government, reacting to adverse opposition to the Gambling Bill, plans to reduce the number of large regional casinos that they will permit to open, and sources in the Department for Culture, Media and Sport indicated that it was unlikely that there would be one opened at Newcastle ." Newcastle United has been in talks with MGM Mirage about developing a hotel and casino next to the Metro Station but, with the Government's about-turn on unlimited Super Casinos, its future is unclear. "Newcastle United PLC today announces that it has signed a 125-year lease for its new Football Academy at Darsley Park. Newcastle upon Tyne. Darsley Park is a 35 acre site currently operating as a Civil Service sports club. It is expected that the site will be available to Newcastle United Football Club from early September this year. The signing of the lease for Darsley Park also ensures continuation of the Football Club's five year Football Academy Licence, which was issued in 1999. "The original site identified for the Football Academy was at Waverdale, in the east of Newcastle. Progress on this site has been significantly delayed due to environmental issues. Consequently Newcastle United Football Club concluded that it would not be possible to progress the plans for the Football Academy at Waverdale, within the timeframe originally envisaged. Newcastle United PLC had estimated the cost of developing the Waverdale site to be in the region of £10 million. "The existing facilities at Darsley Park will, apart from the construction of indoor training facilities, meet the current requirements for training and youth team development, eliminating the need for further major investment in the site." 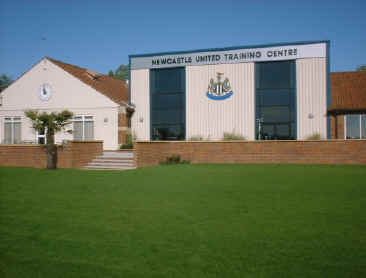 The first team have trained at the purpose -built Newcastle United Training Centre more commonly known as Darsley Park since July 2003. Northumberland FA base of Whitley Park . A valuable part of the centre is the full-size indoor training facility, which has an artificial grass-like surface called FieldTurf, which was also utilised on some outdoor pitches at Darsley Park and the adjacent Academy facility at Little Benton. Other local sportsmen to have benefited from the facilities at Darsley Park include the Falcons rugby team who used the indoor facility to train when bad weather rendered their Kingston Park pitches unplayable. England fast bowler and toon season ticker holder Steve Harmison has also spent some there time doing fitness work with the Newcastle side. After years of borrowing inappropriate facilities and sharing changing facilities with hockey-playing students and the like, a proposal was made in the late 1990s for an Academy base to be constructed at Waverdale in the Walkergate area of Newcastle. Initial planning consent from the local authority was gained in March 2000, but in December 2000, some publicity was given to the fact that as the site had formerly been a rubbish tip, a special permit would needed to be obtained from the government's Environmental Agency before work to clear the site could begin. That plan was subsequently abandoned and a nine hole golf course and driving range have been mooted for the Waverdale site, while Newcastle looked elsewhere for suitable land. 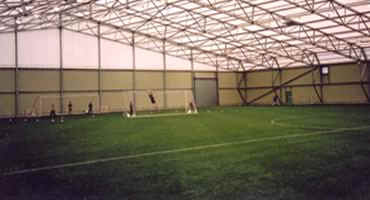 Since season 2003-04, United's youngsters have been housed in a purpose -built headquarters at Little Benton, located to the immediate south of Darsley Park. In September 2004, the club hired the facility out to a TV production company who broadcast the Sky programme "The Match" from Little Benton. And along with St.James' Park and Darsley Park, Little Benton has also been used by the film crews shooting the football movie "Goal!" about an unknown youngster who signs for Newcastle United.